Persuasive presentations should appropriately balance analytical and emotional appeal. At Duarte, we devote a lot of time to creating emotional appeal for persuasive presentations—not because it’s more important, but because it’s underused or non- existent, and should be incorporated. Now that your presentation has plenty of emotional appeal, let’s stay cognizant of its appropriate use. Some topics are inherently emotionally charged—like gun control, racism, or abortion—and therefore naturally lend themselves to more emotional arguments. On the other hand, topics like science, engineering, finance, and academics inherently invite analytical appeals. But just because a presentation is more heavily weighted towards analytical content doesn’t mean it should be void of all emotion. A question that comes up often is, “How much emotion should I use when presenting to a group of economists?” (You can replace the word economist with others like analysts, scientists, engineers, or researchers.) Some people choose their careers because of their analytical nature. If you know the audience has a career in a stereotypically analytical space, only a tiny percent of your appeal should be emotional—but do not leave emotion out entirely! At the very least, open and close your presentation with why. Many times the reason “why” people are involved in economics or science or engineering or research has an emotional component. Don’t strip it out, but don’t overdose on it either. There’s another Greek word in the mix in addition to ethos, pathos, and logos. That word is karios. It means “timing” or “timeliness”—“speaking in the right moment, in the right way.” In order to do this, you must understand the situation, cross-check, and, if necessary, modify your presentation by adjusting its emotional and analytical balance so that it’s appropriate. Keep in mind that all things in life should be done in moderation—including emotional appeal. Emotion should not be over amplified. If it is, the audience will feel manipulated. Appealing to emotion is only effective if it furthers the argument. Creating the right balance is alluring, whereas imbalance hurts your credibility. 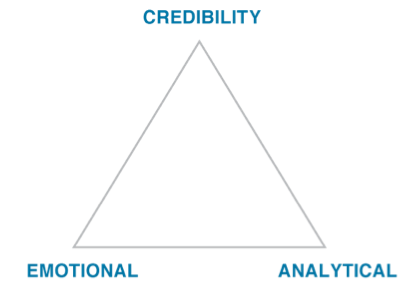 Instead of viewing the rhetorical triangle as something that is static and must be filled in to achieve perfect balance on all sides, consider it dynamic and alter the emotional appeal appropriately based on the situation. If you’re speaking to a broad audience on an emotionally charged topic, then don’t go through pages and pages of analytical research. Pull back on the brainy material. When speaking to a specialized audience in a narrowly analytical field, you need to emphasize analytical content. Notice in the far right triangle on the next page how imbalance will diminish your credibility. Modify the presentation to map to the needs of the audience, increase or decrease the emotional and analytical to match the situation.